Because its a product that comes directly from nature, cork flooring can be found in a wide selection of both colors as well as patterns. Just like the popular granite quarried for countertops, this is one of its appeals. In fact, no two installations are identical. You can find it in shades as dark and deep brown as fine chocolate, or as light tan as pine or poplar. Another interesting quality that it possesses it is a unique density. Corks cellular structure is noticeably different from the typical hardwood traditionally used for residential and commercial flooring. Instead of having a rigid and unforgiving feel, it offers more of a spongy quality. Not only does this give it a comfortable cushioning effect (nice in an area where you work on your feet), but it allows it to absorb sound rather than transmitting it. The two most common styles are planks and tiles. Regardless of which style you choose to install, its critical that you stay away the no name materials. For example, its best to shop for eco-friendly flooring at Lumber Liquidators . Tiles are the way to go when your goal is achieving a specific pattern, like wood parquet floors you may have seen. A prime advantage that tiles offer is that any damaged areas can be easily repaired. So plan ahead and purchase one or two extra boxes and store them in your closet. Almost any kind of construction material is more likely to be a match when it originated from the same lot. Planks seem to be more popular with some homeowners than tiles. You can buy two basic styles. The way they differ is in the method of installation. The older kind is glued down to the subfloor. The newer kind, as you might imagine, is the floating floor kind. The planks snap together just like laminate planks do. This style is usually easier to install and is less messy since no glue is involved. The cork should be either finished following installation or installed pre-finished from the factory. Finishing after installation has the advantage of choosing from a number of finishes. 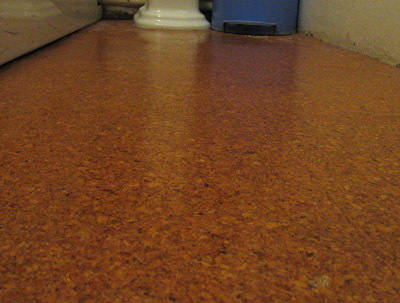 Many homeowners apply three to five coats of a water-based urethane. Why can Cork be an Expensive Product? Here in the in the western hemisphere, all the cork available must be imported. The end product you install started as the bark of the tree that grows in the Mediterranean region countries. These countries include Spain, Tunisia, France, Italy, Morocco, and Portugal. Unlike hardwood flooring like mahogany, oak, and pecan, cork is not simply harvested, milled, and replanted. Only the bark is harvested from the tree. This is done approximately every nine years. This is the main reason that makes it is so sustainable and eco-friendly. But, if the seasons are not favorable, the harvest will not be plentiful, and market prices will escalate. Cork floors are desirable for multiple reasons and they represent a great choice for the homeowner seeking good looks, durability, ease of maintenance, and a wonderful method of boosting home equity.